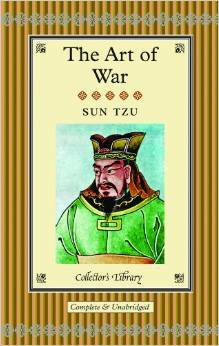 It’s not abundantly clear from the cover, but the hardback, gilt-edged Collector’s Library edition of Sun Tzu’s Art of War is a new edition of my earlier paperback translation. It’s a very portable pocket size, and does look very posh, particularly after you throw away the horrible dust jacket. See here for details of why the world needs another version of Sun Tzu, and here for my thoughts on performance. It’s out now in the UK and in the US. This entry was posted in News and tagged Art of War, China, Collector's Library, Sun Tzu, translations by ixarette. Bookmark the permalink.